This video is free to watch or download. This two part video was produced in conjunction with the book by the same title. 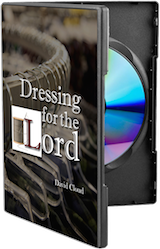 Contains documentation and scripture demonstrating that how we dress makes a statement about our faith and beliefs. Isn’t this just a problem for the men? Since God looks on the heart, why be so concerned about appearance? Men are going to sin anyway, so what is the big deal? Should women only wear drab sack dresses? This is a two part video presentation with added images and graphics. It consists of 36 minute and 30 minute segments.